Well - we made it to pre-post season. Think about that for a second. I've said it before, and I'm sure I will again - the Cleveland Indians can be exhausting to root for, though I always do. I'm a glutton for punishment, I suppose. Mind you, since we moved back to Cleveland in 1995, the Tribe has made the playoffs seven times, not including this year. We had a streak of five years in a row, two of those taking us all the way to the World Series. But a change of ownership, cheap ownership at that, and the best team in our history started to dismantle, not so slowly, but every so surely. ...and then we were bottom of the heap again, save a brief stint in 2007 - our last playoff berth. 2013 was a rebuilding year. Gone was my beloved Travis Hafner...see below. But while I lusted after love the man, he was drawing a huge salary only to be the DL. ...and while I'd love him to be on the Down Low, it was just the Disabled List. So out he went to the Yankees (thank you for them not ending up in another post season anything! ), and we brought in older, but new to us, players. 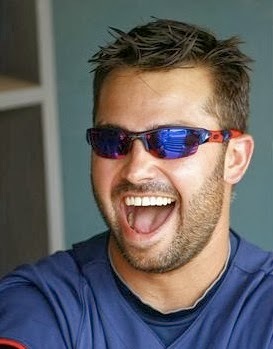 Nick Swisher (title image) and Jason Giambi have been great. Swisher, even before the season started, could not have been happier to be in Cleveland - and he's made the most of it. He's fun, he's funny and he's been hitting like no one's business the last month. And, when we had non-fireworks nights, Nick picked up the tab of $15,000 with his own money, at least twice, just to have them. This is an invested man! For non-sports folks here - we were in a three way race for the Wild Card position for the playoffs - it had been that close to the wire. We snagged a potential spot and ended up playing a one-gamer last night, against Tampa Bay, to see who kept going into the actual post-season. Honestly, if we had not lost five in a row to Detroit at the end of July or beginning of August, we would have won the division - and not even worried about the Wild Card. 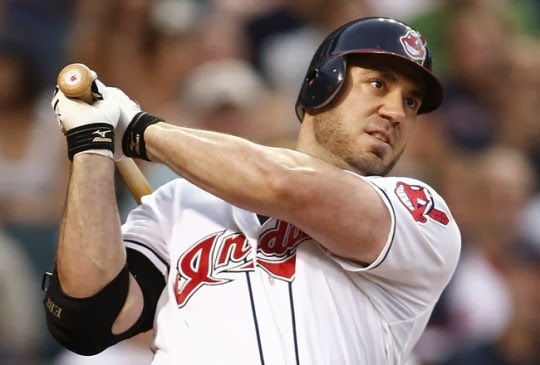 The Tribe had won the last 10 games coming into the post-season - the last time anyone had done that was 1971! I will fully admit to having to keep turning the game off - or at least the channel. We started out weak weak weak. I will also admit that I'm writing this during the 7th inning while we lose 3-0. Yes, it's possible we could come back, but my weak old heart can't take it. But it is what it is and win or lose, these guys have been pretty good all year. I don't think Cleveland could, or should, be unhappy either way. We've put on a great season and here's hoping we are still in it when I wake up.....and if not, well, then next year. we phillies phans are up and down too; we sucked eggs this year (4th place). congrats for making the playoffs; sorry on the loss; now we hibernate until mid-february, when hope will rise once again. I don't follow baseball much anymore, but I'm happy the Tribe and the Pirates are back in the playoffs. Not so happy about this story though.